We all know a glass of Pinotage can make us feel better, but it seems that Pinotage can also make us look better. Got wrinkles around your eyes? Rub Pinotage in and voila! And at just $26 a tube of South African, Pinotage-enriched hydrating eye gel saves you having to open a prized bottle. The New York Observer reports that Manhattan's first vinotherapy salon -- Delluva Vinotherapy Day Spa has just opened. Spa owner Diane Sydney Hanson is a licensed esthetician. I didn't know that one needed to be licensed to practice esthetics, but apparently in the USA esthetics means "the non-medical care of the skin." And according to this site "The esthetician’s fingers convey strength, trust, and knowledge. When an esthetician is touching someone, there is a bonding, a caring, expressed that is missing in so many lives today." I wondered how long it would be before the popular Meerkat would appear on a winelabel. Now Welbedacht winery has introduced Meerkat Chenin Blanc and Pinotage. Neil Pendock said of the maiden vintage 2005 " This juicy Pinotage offers you the sensual extravaganza of mocca chocolate, sweet plums and soft vanilla." I am indebted to Werner Rix of Wine Routes of South Africa www.wineroutes-sa.co.za for news of these wines in his regular newsletter, which also contains the titbit that Domein Doornkraal have produced a sweet blend of Pinotage and Tinta Barocca which they named Pinta. Good name - but I can foresee amusing confusions with visitors from Britain where Pinta means a pint of milk. 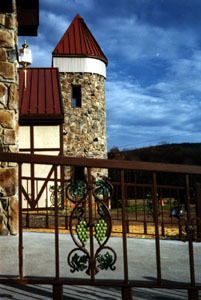 Horton Vineyards, in Orange County, Virginia, will be releasing their first varietal Pinotage in February 2007. Up to now it has played its part in their blends. Neil Glaser of Horton told me "It has become one of our favorite grapes in the vineyard, producing some world class fruit... hey, the wine is not bad either." Neil says "We planted our first Pinotage grapes in 1998... we have been using it as a blend grape in our Syrah... the 2002 Syrah has 17% Pinotage... we will continue to blend these grapes while making a varietal wine out of Pinotage. The release in February will be a 2005."